To view PDF documents download the free Adobe Reader. 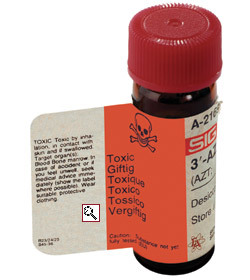 Deadly toxic chemical hazard warning by Sigma Chemical Co. on tiny 25 mg bottles of AZT supplied to research laboratories (move your cursor over the magnifying glass to read it). You obviously don't find this advice on GlaxoSmithKline's AZT label, or in its package insert recommending a daily dose of up to sixty times as much – to be taken every day until you die. Or let's face it: who would ever swallow it? On 7 March 2016, former South African President Thabo Mbeki posted ‘A Brief Commentary on the Question of HIV and AIDS’ on his Thabo Mbeki Foundation website, and linked it to his Facebook page. And the next day posted a link to TIG general secretary Chris Rawlins’s paper, ‘A critical analysis of the underlying assumptions used by Chigwedere et al in their article “Estimating The Lost Benefits of Antiretroviral Drug Use in South Africa” published in JAIDS in December 2008’. On 14 March, Mbeki posted 'Some Observations on HIV & Mortality in South Africa: 2007, 2008 & 2013'. Mbeki's articles are linked here, along with reaction from what Mbeki, quoting Herbert Marcuse, calls 'the ominipotent apparatus'. Rawlins's further analyses are posted near the end of this page, including a summary published on 9 March. Citing more recent data published by the HSRC, MRC, StatsSA and ASSA, his later papers update and strengthen the conclusions of his 2009 refutation of the Chigwedere paper to which Mbeki referred. The Sunday Tribune publishes Rawlins's letter about this on 20 March (hit the link above, or at the end of this page). On 28 October 1999, after reading an early draft of High Court advocate Anthony Brink’s book Debating AZT: Mbeki and the AIDS drug controversy (PDF, 1.2 MB), then subtitled ‘Questions of safety and utility’, South African President Thabo Mbeki ordered an enquiry into the safety of the AIDS drug AZT (PDF, 188 KB). ‘“That,” Mbeki told me, “is what sparked it off.”’ – Mark Gevisser, Thabo Mbeki: The Dream Deferred (Jonathan Ball, 2007). Rasberries and plaudits. Introducing AZT: ‘A world of antiretroviral experience’ cites research findings published after	Debating AZT went to print in November 2000, and liberally quotes South Africa’s leading AIDS experts, AIDS activists and AIDS journalists on AZT to enable you to form your own opinion after hearing both sides (PDF, 1 MB). Sure, AZT is extraordinarily toxic, but does it have any countervailing value as a medicine? In other words, do its benefits outweigh its risks? Or to put it more directly: is AZT really antiretroviral? An Open Letter to GlaxoSmithKline SA CEO John Kearney on 26 April 2001 addresses this question (PDF, 51 KB), conveying the gist of A Critical Analysis of the Pharmacology of AZT and its Use in AIDS (PDF, 425 KB) by Australian physicist Eleni Papadopulos-Eleopulos and her medical colleagues, published in June 1999 as a special supplement to Current Medical Research and Opinion. It’s summed up in an unpublished letter (PDF, 96 KB). The AZT triphosphorylation problem examined in this paper has been discussed by other scientists, such as Lavie and colleagues of the Max Plank Institute (PDF, 451 KB) and by Dr Dennis Blakeslee, a medical correspondent for the Journal of the American Medical Association (PDF, 783 KB). Is AZT a DNA chain terminator as GlaxoSmithKline and even the drug’s critics Professor Peter Duesberg and Dr David Rasnick claim it is? Or is it extremely toxic for entirely different reasons? GlaxoSmithKline hired its fantastically richly paid consultant and grant recipient (PDF, 114 KB) Professor David Back at the University of Liverpool to claim in an expert report filed in the High Court in South Africa that AZT is triphosphorylated just like the company says (PDF, 1 MB). Papadopulos-Eleopulos and colleagues examined and rebutted his false claims (PDF, 42 KB). In April 2001 the Medicines Control Council (MCC) conditionally approved nevirapine, another exceptionally toxic drug, for experimental use to prevent mother to child transmission of HIV. The Treatment Action Campaign successfully applied to court to force the government to abandon its UN-AIDS-sanctioned pilot study and to provide the drug in the maternity wards of all government hospitals across the country without more ado. The trouble with nevirapine is a comprehensive exposé of the whole shambles (PDF, 1 MB). Between June 2004 and January 2005 we addressed ten letters to the MCC, commencing with an enquiry about the status of its review of its special registration of nevirapine for administration to HIV-positive women in labour and their newborn babies, which it had announced in May 2002 after a licensing application for similar special registration had been thrown out two months earlier by the American Food and Drug Administration . We also provided the MCC with Papadopulos-Eleopulos’s et al. seminal critiques of AZT as an AIDS drug (PDF, 416 KB), and AZT and nevirapine as perinatal anti-HIV prophylactics (PDF, 2.03 MB), along with an easy-to-understand slideshow critically examining the notion that nevirapine prevents mother to child transmission of HIV (PDF, 1.23 MB). The MCC’s response to our first letter was to issue a recommendation that nevirapine administration to pregnant women and their babies should henceforth always be combined with AZT. Our further correspondence criticized this decision in the light of the many published studies showing how AZT harms unborn and newly born children. On receiving our submissions, individual members of the MCC told Health Minister Dr Manto Tshabalala-Msimang that they’d been ‘amazed’ by our ‘detailed research’ of which they had been ‘unaware’. Well, clearly. We can reveal that Dr Tshabalala-Msimang read all our correspondence to the MCC with great interest, as did President Mbeki. Poisoning our Children: AZT and nevirapine in pregnancy collates our letters in a book (PDF, 1.19 MB), including: the MCC’s ultimate non-response to our submissions (PDF, 177 KB); an afterword reviewing the latest research reports on how ARV drugs given during pregnancy stunt infant body and head growth and damage bone marrow causing reduced blood cell production in childhood; and how these drugs are causing brain damage to South African children, crippling them mentally and physically. Inventing AZT is the scoop story told to Brink by Professor Richard Beltz, the scientist who first synthesized AZT in 1961 – as an experimental cell-poison to kill human cells (PDF, 128 KB). It relates how Brink changed Beltz’s mind about the wisdom of giving AZT to pregnant women by drawing his attention to what it does to their babies. Licensing AZT (PDF, 178 KB) describes the fraudulent circumstances in which AZT came to be licensed by the Food and Drug Administration as an AIDS drug in the US – with everyone just following suit around the world, no questions asked, our own MCC included. Here are the front cover (PDF, 988 KB), back-cover blurb (PDF, 15 KB), and prospectus (PDF, 411 KB) for Brink’s magnum opus in the works, ‘Just say yes, Mr President’: Mbeki and AIDS. What killed Makgatho Mandela? : a press release (PDF, 58 KB). • Hundreds of studies have found that AZT is profoundly toxic to all cells of the human body, and particularly to the blood cells of our immune system. • Numerous studies have found that children exposed to AZT in the womb suffer brain damage, neurological disorders, paralysis, spasticity, mental retardation, epilepsy, other serious diseases and early death. The Treatment Action Campaign complained to the Advertising Standards Authority about these statements, as if they were untrue. The ASA declined to consider the merits of our submission (PDF, 238 KB), saying it wanted one ‘credible independent expert’ to substantiate our statements, and not the hundreds we cited in two lever-arch files sent up, and banned us from ever repeating them (PDF, 1.4 MB). We then provided a single expert verification statement by Professor Sam Mhlongo (PDF, 72 KB), and followed up with a query (PDF, 94 KB). When the ASA rejected Professor Mhlongo’s supporting statement on spurious grounds, we asked Medicines Control Council chairman Professor Peter Eagles to confirm to the ASA that our statements are perfectly true (PDF, 17 KB), and requested the same of MCC Registrar Dr Humphrey Zokufa (PDF, 24 KB) – but no joy from either. On 11 November 2005 the Mail&Guardian published Brink’s letter (edited a bit) about the M&G’s editorial policy to promote AZT and the harm it does (PDF, 20 KB). Professor Cyril Karabus of the Red Cross Children’s Hospital in Cape Town and a schoolboy called Alex Myers responded the following week by writing in to say how dishonest and dangerous he is (PDF, 121 KB). Brink replied to Karabus directly (PDF, 48 KB). A letter to Constitutional Law Professor Pierre de Vos, then at the University of the Western Cape, pulling his leg (PDF, 36 KB). The Judith Miller Award for AIDS Journalism in South Africa was won in 2005 by Kerry Cullinan (PDF, 19 KB). A letter (PDF, 90KB) to Dr Olive Shisana, CEO of the Human Sciences Research Council and lead author of the South African National HIV Prevalence, HIV Incidence, Behaviour and Communication Survey, 2005. This reminder to Dr Shisana posed more rude questions (PDF, 30 KB). In a letter to Professor Anthon Heyns, CEO of the South African National Blood Service, Brink spelt out the logic of the HSRC’s ‘HIV Prevalence’ report for policy at his blood bank (PDF, 64KB). The day after it was sent, Heyns published an article in JAMA, the world’s leading medical journal, claiming that yes, segregationist policy at the blood bank was the right way to go after all; why, he’d proven it scientifically. Unlike Brink in his ironic letter, the professor wasn’t joking, he really meant it. The Treatment Action Campaign arranged a hit (PDF, 96KB) on Brink in the Sunday Times on 5 February 2006, to which he replied (PDF, 11KB). These are the commercial plugs referred to in his letter (PDF, 18KB). An edited version of the letter was published two weeks later, leaving out the embarrassing ‘product placement’ story (PDF, 93KB). Brink posed some questions to AIDS journalist Tamar Kahn (PDF, 44 KB) about an exciting article she wrote (PDF, 162 KB). And here’s a letter to Dr Francois Venter, president of the Southern African HIV/AIDS Clinicians Society, suggesting an exciting new way to fight AIDS (PDF, 31 KB). The Treatment Action Campaign had a go in the Cape High Court at shutting us up and shutting us down. Brink’s answering affidavit (PDF, 514 KB) blew the TAC, its drugs and its virus out the sky (filleted for relevance you can read the TAC’s founding affidavits hyperlinked to it). Professor Mhlongo filed a confirming affidavit (PDF, 31 KB). Three days after seeing our Heads of Argument (PDF, 15 KB), the TAC dropped its case against us and ran for the hills (PDF, 202 KB). We wrote a letter to M&G CEO Trevor Ncube entitled Media Complicity in Genocide: the Case of the Mail&Guardian (PDF, 93 KB) and served a copy on the ICC with supporting annexures (PDF, 23 KB) under this covering letter (PDF, 36 KB). The letter was an appeal to conscience but apparently no one was home. Brink attended a high-powered AIDS conference in Bonn, Germany, in May 2007 and wrote (PDF, 46 KB) to the organizers afterwards, his head spinning from the experience. In October 2007, on the 50th anniversary of the thalidomide disaster, we released a Press Statement on AZT in pregnancy: another tragedy of countless children killed and maimed foretold (PDF, 45KB). We followed up with a letter to Dr Tshabalala-Msimang about it but too late (PDF, 133 KB). In Fit to Govern: The Native Intelligence of Thabo Mbeki, Ronald Suresh Roberts claimed that ‘Thabo Mbeki is not now, nor has he ever been, an AIDS dissident.’ Brink’s book Lying and Thieving: The fraudulent scholarship of Ronald Suresh Roberts took him to task. We responded to a request for an interview by Litsa Delli, television producer for MEGA-TV, Athens, Greece (PDF, 171 KB); these are the hyperlinks in the letter. Politicsweb published Martin Weinel, Thabo Mbeki and AZT: Bogus scholarship in the Age of AIDS: A case study on 27 March 2009. Here’s our email to his university about it on 2 April, two answers, and our reply. A letter to Essop Pahad, editor of the Thinker. A letter to psychology lecturer Desmond Painter concerning his review of 'The trouble with nevirapine' in Die Burger. A reply to Rev Julia Denny-Dimitriou’s go at Brink in her gushing review in the Witness of big-time AIDS journalist Kerry Cullinan’s ridiculous book The Virus, Vitamins and Vegetables. The reply was published on 18 May 2009. Where are all the dead Zulus?, a letter to the editor of the Witness – rejected for publication because ‘the debate has run its course’, the deputy editor said, which is to say is over. On Satire, a letter to Zapiro, cartoonist for the Mail & Guardian and other newspapers (PDF, 288 KB). A letter to former Chief Justice Arthur Chaskalson about the nevirapine case in the Constitutional Court (PDF, 115 KB). A critical analysis of child HIV prevalence as presented in the South African national HIV prevalence survey of 2008 (HSRC June 2009) by Chris Rawlins (PDF, 43 KB). Deconstructing Duesberg: A Critique of ‘HIV-AIDS hypothesis out of touch with South African AIDS – A new perspective’ by Claus Jensen (PDF, 44 KB). Transparency and Conservative Values in Chigwedere et al. : The 6.7 Years ARV Treatment Benefit Estimate in Chigwedere et al. ‘Estimating the Lost Benefits of Antiretroviral Drug Use in South Africa’ by Claus Jensen (PDF, 36 KB). A critical analysis of the underlying assumptions used by Chigwedere et al in their article ‘Estimating the lost benefits of antiretroviral drug use in South Africa’ in JAIDS, December 2008 by Chris Rawlins (PDF, 73 KB). A reply to the TAC’s claim in a press release published on Politicsweb on 6 October 2010, ‘Donor shortfall will cost lives’, that unless Western governments give the pharmaceutical industry billions more for its ARV drugs, millions of poor will die. Mbeki and AIDS in Frank Chikane’s memoirs. On 18 December 2009 the Californian Office of Environmental Health Hazard Assessment (‘OEHHA’) added AZT to its list of substances known to cause cancer and reproductive toxicity (PDF, 500 KB, excerpts). The drug was first prioritized as being ‘of High Carcinogenicity Concern’ in October 2003 (PDF, 68 KB) and placed on the OEHHA’s draft priority list that month (PDF, 288 KB). AIDS activists tried preventing their favourite drug AZT’s classification as a known carcinogen on 3 December 2003 (PDF, 499 KB), but unsuccessfully, because on 12 June 2009, after a comprehensive review of the research literature, the OEHHA invited final comments before listing it as such (PDF, 77 KB). The AIDS activists tried preventing this again (PDF, 117 KB), but again unsuccessfully, and on 18 December 2009 the OEHHA listed AZT as a known carcinogen (PDF, 591 KB). An HIV positive pilot was denied the renewal of his flying license for refusing to swallow an ARV cocktail that made him sick. Brink drew his application for the decision to be reviewed and set aside. Being unanswerable it wasn’t answered, but it got dismissed anyway; see why. In February 2008 Rhodes University pharmacology tutor Roy Jobson raised the subject of antiretroviral drugs on his ‘Thought Leader’ blog hosted by the Mail & Guardian. Brink and others, including some doctors and another pharmacologist, responded. Current Medical Research and Opinion and ‘medical publication ethics’: The curious case of the Perth Group’s missing AZT pharmacology paper. Chris Rawlins performs a comprehensive study (PDF, 120 KB) of the statistical data published by leading government and research bodies since 1996, and demonstrates conclusively that there's no evidence for a new viral cause of death in South Africa. The irreconcilable contradictions within and between the data published by these bodies, the lack of any correlation between the estimates and the official registered mortality figures, the mathematical impossibility of reconciling the age and gender estimates, and the failure of all the hypothetical model predictions all show that the various tests claimed to detect a transmittable virus have no scientific validity and reliability and are diagnostically useless as a basis for prescribing chemotherapy cell poisons. Rawlins presents a tabular summary (PDF, 122 KB) of his three previous comprehensive analyses, debunking the claims made by a Harvard University paper published in JAIDS in December 2008; the Human Sciences Research Council’s national survey of 2008; and the Actuarial Society of South Africa’s 2008 model based on the Department of Health's antenatal statistics, that causal relationships exist between the measurement labelled hiv and the increase in child mortality in South Africa up to 2006, and the use of drugs labelled antiretroviral and the decrease in child mortality after 2006. Utilising further data from the latest HSRC survey of 2012; the Medical Research Council study of under-5 mortality statistics of April 2012; and Statistics South Africa's annual mortality and causes of death reports up to 2012, the summary categorically demonstrates shows that there is no causal relationship between the measurement labelled hiv, the drugs labelled antiretroviral, and child mortality in South Africa. On 9 March 2016, Rawlins’s latest: The irreconcilable contradictions between the HSRC's hiv statistics and StatsSA's mortality data (PDF, 10 KB). The Sunday Tribune publishes his letter about this on 20 March (PDF, 385 KB). With two errors: The US Pepfar fund allocated more than 5 billion dollars, not rands. And the Catholic Church has been spending up to 60 million rands annually on the drugs, not R60,000 – per Sr Alison Munro, Director of the Aids Office of the Southern African Catholic Bishops Conference, page 27 of Catholic Responses to Aids in Southern Africa, edited by her and Fr Stuart Bate. The Treatment Information Group is a public interest initiative in South Africa to promote research-based debate of antiretroviral drug policy, alternative non-toxic treatment approaches to AIDS, 'HIV' testing issues, and 'HIV' itself. Anthony Brink is founder and chairman, and Chris Rawlins is general secretary. Brink's books with cover images are catalogued at Openbooks. The Unbelievable Mediocrity of David Crowe: Why Rethinking AIDS has the president it deserves: critical materials by the Perth Group and their supporters concerning the core scientific and strategic issues that have profoundly hampered progress in dismantling and discrediting the 'HIV/AIDS' construct. For further incisive analyses of these problems, see The 'HIV' Symposium blog and 'Rethinking AIDS' Exposed forum.